Mortadella is a large Italian sausage (salume) made of finely hashed/ground heat-cured pork sausage which incorporates at least 15% small cubes of pork fat (principally the hard fat from the neck of the pig). It is flavoured with spices which include black pepper (whole corns or ground), myrtle berries, nutmeg, coriander and typically pieces of pistachio nuts. Traditionally the pork filling was ground to a paste using a pestle and large mortar (mortaio). 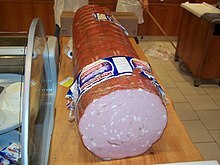 A similar commercial product, called "bologna", "bologna sausage" or "baloney", and often omitting the cubes of pork fat, is popular in the United States. It is also known as "polony" in the United Kingdom and some countries in the Commonwealth of Nations.